June’s residential resale market data is as bewildering as the data was in May. The attention getting news is that sales were lower by 37.3 percent compared to sales achieved in June 2016. Last year 12,725 properties were reported sold. This June only 7,974. Not only did most properties sell quickly, but they sold on average for their asking price or more. Detached houses in the City of Toronto all sold for 100 percent of their asking price. In the eastern trading areas, they sold for 101 percent. Semi-detached property sales, for the most part, were even stronger coming in at 103 percent of their asking prices. Even condominium apartments sold for 101 percent of their asking price. These two aspects of the market indicate that buyers are prepared to move quickly for the properties they want, and sellers are getting their asking prices or higher, and as indicated above, these sales are taking place at the same pace as they did during last year’s record breaking market. As a footnote, it should be noted that with so many properties having been listed more than once in the first two months, it is hard to determine if days on market and sales to list ratios are reflecting accurately. One other aspect of the market should be highlighted. That is the months of inventory. Over the past two months, inventory levels in Toronto have increased dramatically. In May inventory levels were up almost 50 percent compared to the same period last year. During the month of June, 19,614 new properties came to market, almost 16 percent more than the 16,918 properties that came to market in 2016. 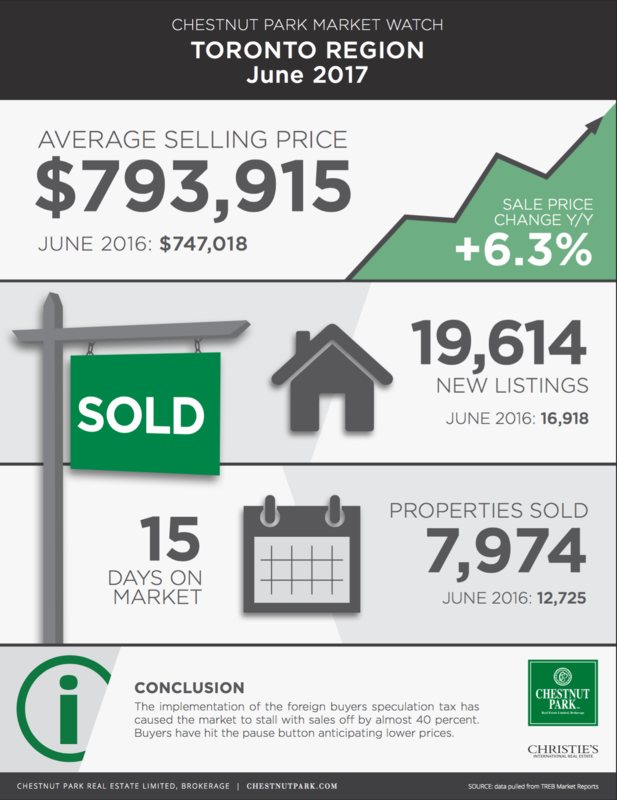 However, notwithstanding these massive increases in inventory, at the end of June active listings only totaled 19,680. At 19,680 available properties for sale, the months of inventory was still only 1.2 months based on a 12-month moving average. In the central core of the city, the average sale price for condominium apartments came in at $619,428, with all sales taking place in just 15 days and at 101 percent of the asking price. Although prices are considerably higher than they were a year ago, they have come down dramatically from the highs of April. At the mid point of the month, the average sale price for homes in the greater Toronto area was $949,470. That price has steadily drifted down since then. Over the past few weeks, it appears have stabilized around $775,000, which is still higher than the average sale price of $747,018 in June of 2016. The implementation of the foreign buyers' speculation tax has caused the market to stall with sales off by almost 40 percent. Buyers have hit the pause button anticipating lower prices.